With their fifth-round pick, the Red Sox have selected Josh Ockimey, a first baseman from SS Neumann Goretti High School (Philadelphia, PA). Ockimey was a bit of a surprise pick, as he was not rated among Baseball America's Top 500 prospects. 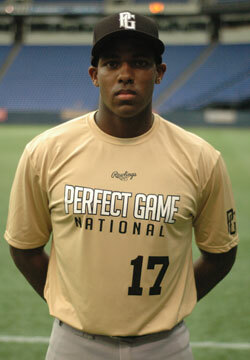 He is a raw high school left-handed hitter with big power potential, listed at 6-fout-4, 220 pounds. Jim Callis of MLB.com reported that the Red Sox hosted him on a pre-draft workout in which they were very impressed. Callis also used Ryan Howard as a potential player comp for him. He has good bat speed and raw power, according to Prospect Insider. Though his swing will likely need some adjustments in pro ball, he projects to have the athleticism to do so. He looks to be a first base-only prospect, so the bat and power will need to be his carrying tools. Overall, he is raw and will likely take some time to develop. Ockimey has committed to Indiana University. He is the second first base prospect selected in this draft, following Sam Travis in the second round.